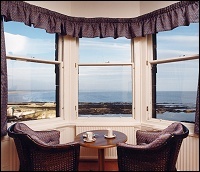 The small, family-run Hazelbank Hotel, fronting on St. Andrews Bay, is very near to the Old Course and only a five minute walk to the center of town. Built in 1898, the Hazelbank has managed to retain many of the features of its Victorian design. Each of the ten, beautifully decorated, comfortable guestrooms has a full, modern bathroom and modern conveniences including television and direct-dial telephone.